Facebook has more than 2 billion monthly active users (MAUs), so it makes sense for affiliate marketers to have a presence there. It has many channels to promote goods and services and more paths than other social media platforms including YouTube, Twitter, and Instagram. On the flip side, Facebook has been around for years so getting noticed is challenging. First-mover advantages are still available, but harder to find and maintain. Regardless of how and where you advertise on Facebook, you’ll need to attract thousands of clicks as you would anywhere else. 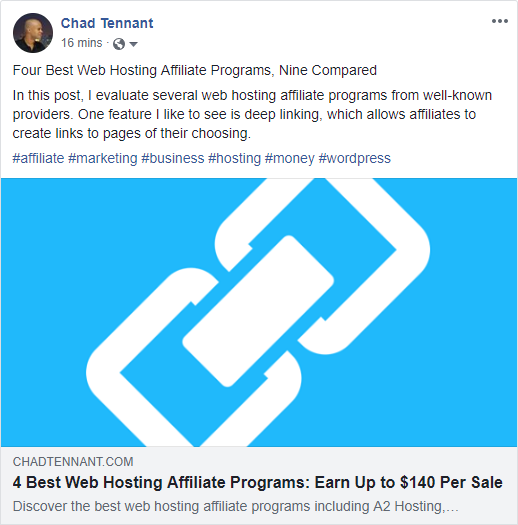 Many publishers post affiliate links on Facebook, which is legit and not against Facebook’s guidelines (although it prohibits links from specific sites). When adding affiliate links to posts, you should add the appropriate disclosures as per FTC guidelines, for example, #Ad or #Affiliatelink. The direct affiliate marketing approach aims to promote products and services in posts. 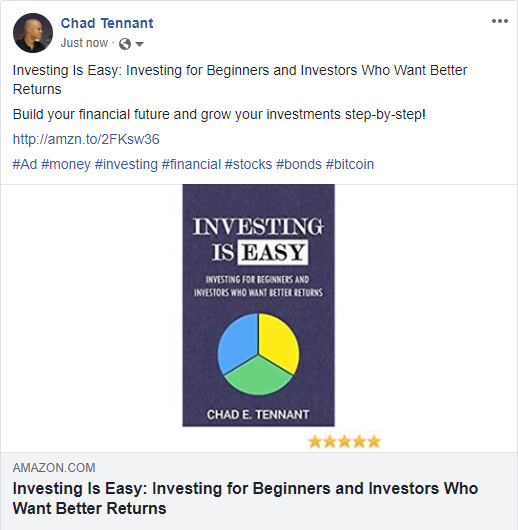 For example, you create a Facebook post about a book that you read and include an affiliate link from Amazon.com. Whoever clicks on the link will go straight to Amazon. By contrast, the indirect approach aims to direct traffic offsite where affiliate links are present. For instance, you create a Facebook post about the best marketing tools and add a link to your blog. I use direct and indirect methods as they are both useful. I typically use direct methods to promote free items, trials, and pay per lead programs because they’re low resistance and high converting. I direct traffic to my blog when I want to influence, persuade, and provide context and details. What is your plan? What will you promote, where, and how often? If I only promote items from my profile, I won’t achieve my goals. Also, I might appear as a desperate spammer who doesn’t care about building trust and relationships. (Success in affiliate marketing depends on trust and loyalty.) Alternatively, marketing in my Facebook group makes perfect sense because posts mimic ads and ads are common on Facebook and other networks. Posting frequency is unique to each person and what makes him or her comfortable. One post a day or every other day works for me. How will you track and assess your activities? I use Google Analytics to monitor traffic from Facebook to my site. It gives me an understanding of how I’m doing and enables me to compare my Facebook traffic to other sources like Twitter, YouTube, organic search, and email marketing. Facebook provides social media analytics/insights to page and group owners. Also, there are many third-party Facebook marketing tools. My affiliate marketing activities are extensive, so my goal isn’t to understand how much of my affiliate revenue comes from Facebook. Moreover, creating links specifically for Facebook and attempting to pinpoint income would be inefficient and time-consuming. Marketing automation adds another wrinkle to the conversation. Some affiliates automate their posts with software like Hootsuite, but I don’t. I’ve tried automating on Facebook and was unimpressed with my results. I prefer to post natively and schedule content to meet my objectives. Still, using a third-party automation application could work for you. Hashtags never became the “it” thing to do on Facebook compared to Twitter and Instagram, but a couple of studies show that adding hashtags can increase impressions, click-through rates, and engagement. Creating a profile is a requirement to be on Facebook. A profile is where you can express who you are and what’s going on in your life. Completing your profile will work in your favor to build your brand, relationships, trust, loyalty, and credibility. Affiliate marketing activities will work on your profile if you have many engaged followers. However, you won’t have onsite analytics like you would with Facebook pages and groups. You can use a URL shortener service like Ow.ly or Bitly to track clicks and other data. Affiliates use direct and indirect marketing methods on their profiles. Your posts could reflect your work, experiences, interests, and hobbies. Facebook Pages enable individuals, public figures, businesses, organizations, and other entities to create an authentic and public presence on Facebook. A Facebook page can be handy for affiliate marketing because it’s more dynamic than a profile. Page owners get many settings and can access Facebook Page Insights to understand how their pages are performing. The Facebook Page Insights tab focuses on three core areas: page likes, post reach, and engagement. Also, you can track followers, page views, and video statistics. One way to use Facebook Pages is to focus on a theme or topic and promote related products and services. For instance, a travel and leisure page would feature content about travel, vacation, lifestyle, adventure, relaxation, and so on. The affiliate could post flash sales for discounted airfares, accommodations, and car rentals. If the affiliate has a travel blog, she can post content from her site. If you create a page about you, your posts can relate to your work, experiences, interests, and hobbies. Facebook Ads allow individuals and businesses to run paid ads on Facebook. To run ads, you need a Facebook page. Before using ads, you’ll want to understand Facebook’s policies. Affiliate links, redirects, and suspicious sites/landing pages get many people suspended and banned from using ads and even Facebook. Facebook will review an advertisement before approving or declining it. Ads can be beneficial if you’re well-versed in advertising techniques and best practices. For instance, you would use an attention-grabbing headline, an eye-catching image or thumbnail, a clear call-to-action, and so forth. You’ll want to understand how to set up an ad to optimize conversions and return on investment. Ads cost money, so start with a small budget and experiment until you understand what works. Study the ads of others for ideas and insights. The direct marketing approach isn’t the way to go. Instead, I recommend directing traffic to your website or landing page as part of a marketing/sales funnel strategy. Also, sending people to your site is less likely to attract Facebook police. Many affiliates use ads to build their email lists, which trigger autoresponse sequences containing affiliate links and products for sale. Facebook Groups allow people to unite around a common cause, discuss issues, and share relevant content. As the previous owner of a large Facebook group, 40,000+ members, I got tremendous value from it. For starters, I controlled group activities and announcements, which were critical to my affiliate marketing strategies. While a Facebook page can be an asset, a Facebook group can be just as valuable and easier to grow. Additionally, there are eleven ways you can make money from Facebook groups. My Facebook group focused on providing free access to online courses. Given the group’s objective, I promoted free courses and trial programs from e-learning sites such as Coursera and Treehouse. I occasionally promoted items that members may have found interesting like Grammarly, a free online grammar checker, and TubeBuddy, a free YouTube channel building tool. Where some marketers go wrong is by promoting items that have minimal relation or no relation to a group’s objective. For instance, it doesn’t make sense to post flight deals in a group about app development. Similarly, I see many publishers spam Facebook groups with affiliate links, which is a low-probability way to generate commissions. In highly active groups, posts and affiliate links are buried within minutes by newer posts. Messenger is Facebook’s messaging app and is used to communicate with others on its platform. Messenger has more than a billion users, and millions of people use it every day. Messaging random people or your contacts with affiliate links is impractical, inefficient, low probability, and a good reason for Facebook to ban you. An efficient approach would be to implement a chatbot to automate some of your activities. Some affiliates create bot funnels to replicate their sales funnels and email autoresponders. Bots work in concert with pages, so you must have a Facebook page to enable. Facebook has policies and usage guidelines for Messenger and will shut down spammy and abusive bots. I haven’t taken the bot approach, but many publishers cover bot affiliate marketing on their blogs and YouTube.